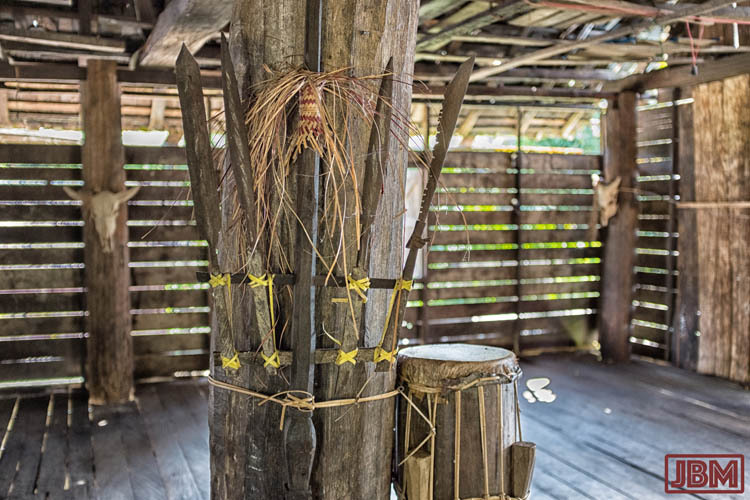 After our visit to Tumbang Anoi, the next destination on our ‘Tur Tiga Betang’ (our ‘Three Longhouse Tour’) was to the longhouse known as ‘Betang Damang Singa Kenting‘ in the Dayak (Ot Danum) village of Tumbang Korik. Like the Betang Damang Batu in Tumbang Anoi, it’s located in the upper reaches of the Kahayan river system, in the district of Gunung Mas, Central Kalimantan. It’s a really interesting place, a well preserved betang in a beautiful forested setting – with spectacularly tall pantar poles out in front. But visitors aren’t common. We think we found out why. 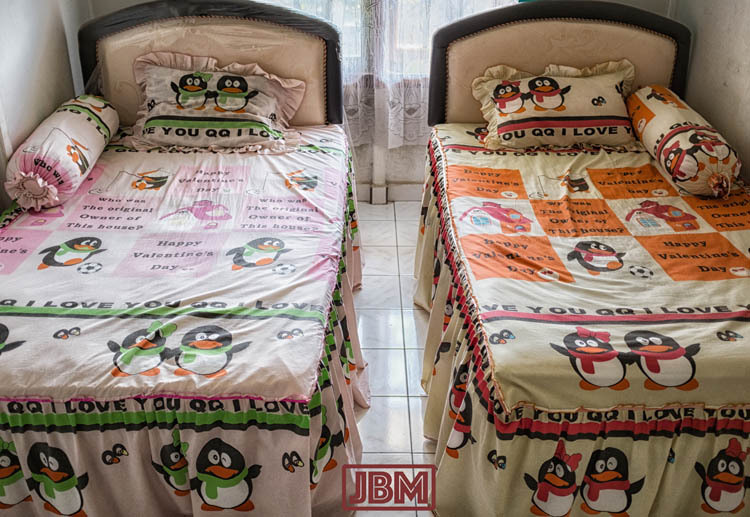 *You may (or may not…) be wondering why so many villages in Central Kalimantan are called ‘Tumbang…’ . 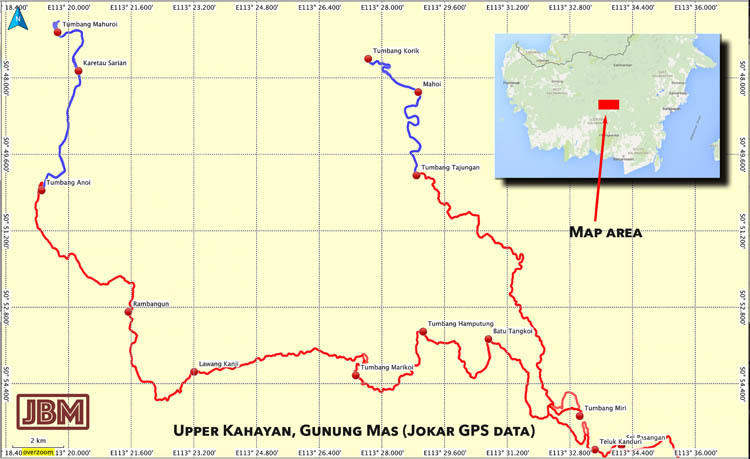 It’s because ‘Tumbang’ indicates that the village is located at the junction of a small tributary river (e.g. the Anoi, Korik, or Miri rivers) with a larger river. You can go all the way from Miri to Korik by klotok (longboat), but the boat hire is expensive and the journey is long, so Dodi drove us as far as Tumbang Tajungan. That way we’d only need to use klotok for the last part of the journey. 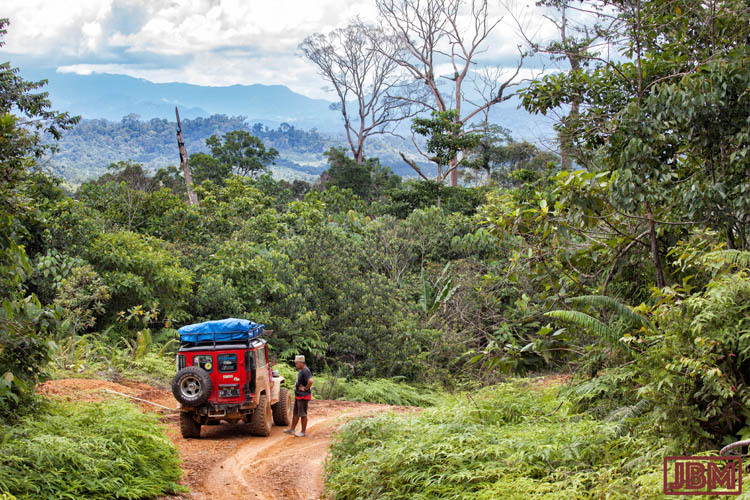 The first stages of the dirt road to Tajungan were very rough – and then it steadily deteriorated through the remainder of the trip. There was (variously) deep mud, deep channels in the road surface, broken bridges, and several sequences of rollercoaster hills. (But fortunately no fallen trees). Ominously, we could see some bike tyre tracks in the road surface, but no car tracks. The road – if we may call it that – has clearly not benefited from any maintenance work in recent years. And this area receives a LOT of rain (nearly 7 metres of it annually) so it’s perhaps not surprising that the surface is a bit eroded. The upside to this is that we passed through some of the best and least disturbed stands of forest that we saw anywhere in the district of Gunung Mas, and we were rewarded by some lovely views of the Schwaner Mountains which separate Central and West Kalimantan. Our arrival in Tumbang Tajungan was greeted with some surprise. We were told that ours was the first car to arrive since December (four months previously!) It seems that we had at last found “The Road Less Travelled”! During the wet season some motorbikes still make the road journey, but most transport is by boat on the Kahayan River. We can understand why. 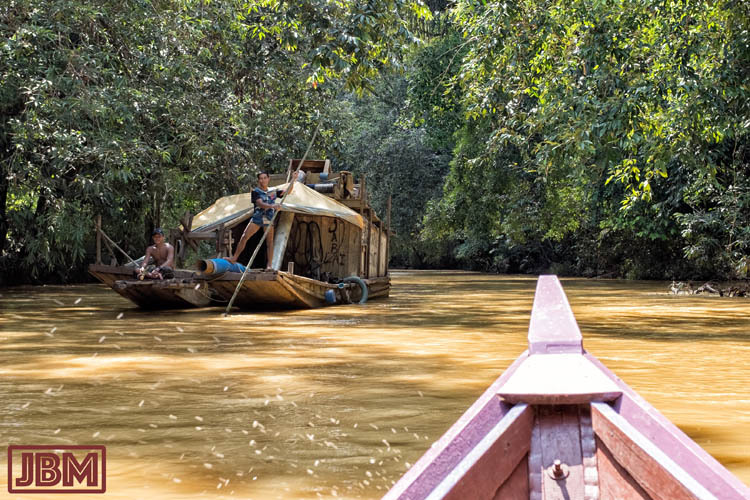 A willing klotok owner was soon found, and we were soon heading upstream on the lovely Miri River towards Tumbang Korik. We passed only a few other klotok along the way, and one gold mining dredge (above) which was moving slowly downstream. One man stood on the bow with a long bamboo pole to check the river depth so as not to run aground, while another man sat beside him… fishing. We saw kingfishers and macaques in the trees which hung over the river. 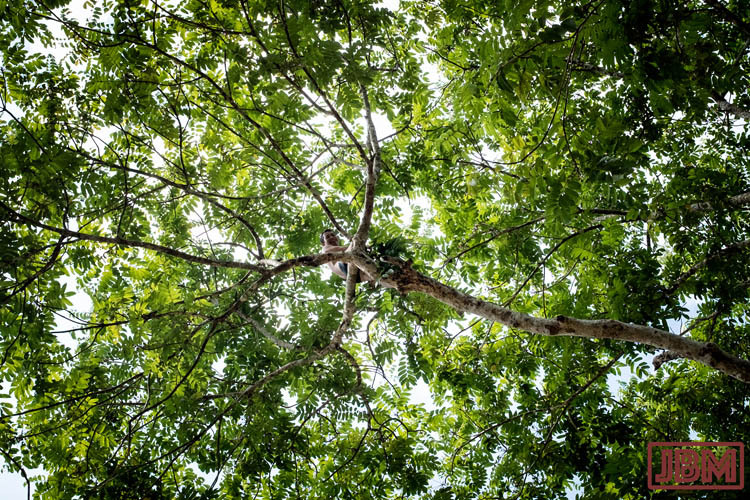 At one point we heard a voice and looked up to see a man directly above us, sitting WAY up on the overhanging branch of a large tree, and laughing. He was collecting fruit of some sort. He must have really wanted them, because he seemed to be quite precariously perched up there, and it was a long fall into a shallow river if he lost his balance. The Betang Damang Singa Kenting, built around the mid-19th century, and repaired several times since, faces the river in Tumbang Korik. Its founder was Kenting, who earned the extra title of ‘Singa’ (Lion) because of his authority in the Dayak community. He was heavily involved in the 1894 gathering of Dayak chiefs at Tumbang Anoi which agreed to end the practices of headhunting and slavery. His wife was the sister of Damang Batu (who was the chief at Tumbang Anoi). Like other betang, it is constructed from kayu ulin (ironwood), and it sits on top of tall ulin posts (known as tiang). There is almost always only one way in, some rickety steps culminating in a steeply angled log with steps cut into it (hejan). The idea is that this affords some protection for the occupants from what the Museum Balanga euphemistically describes as ‘wild animals and bad-mannered people’ (i.e. 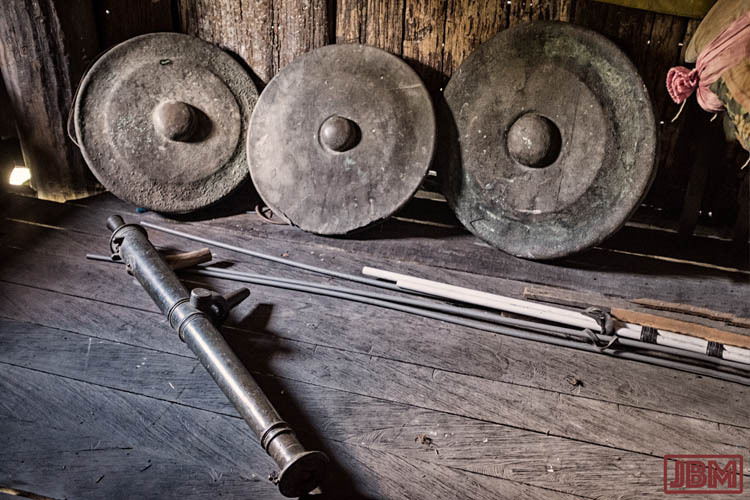 headhunting raids by warriors from other tribes). There were previously three betang in Tumbang Korik, but the other two (Betang Jaga Kamis and Betang Jaga Jahan) now lie in ruins nearby. It’s sad to see, because it’s highly unlikely that any new ‘real’ longhouses will be built (in Central Kalimantan, at least). 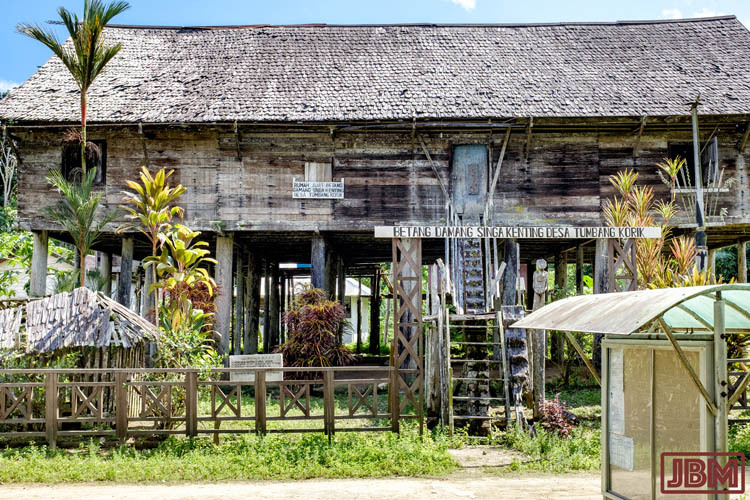 Apart from the near-disappearance of kayu ulin from the forests of KalTeng, people simply don’t want or need to live in large communal housing structures like that any more. We were shown around by Pak Ringkai Rumpoi, 66 years old and a sixth generation descendant of Singa Kenting. Inside there is little furniture, and plenty of light comes in through the gappy planks in the walls.The timber surfaces are all smooth and well seasoned. (It reminded me a little of an old Australian shearing shed). 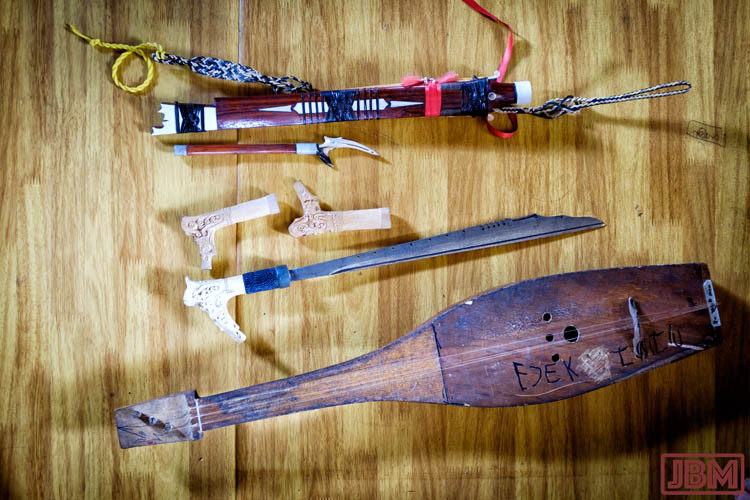 One tiang pillar in the middle of the room is adorned with a sangkalang with four weapons (a duhung, two luju, and a mandau). Beside the tiang is a drum. This particular kind of ceremonial drum is called sumbu tutung in the Ot Danum language (and a gandung in Dayak Ngaju), and the skin is from kulit bajung (a type of deer). Buffalo skulls from a 1998 Tiwah ceremony hang from other posts. The interior walls are made from sheets from bark of kayu pendu. In another room is a really old (and somewhat corroded) set of bronze gongs, and the barrel of a small (presumably Dutch-era) canon. Out in front of the betang stand some spectacularly tall poles known as pantar panjang. 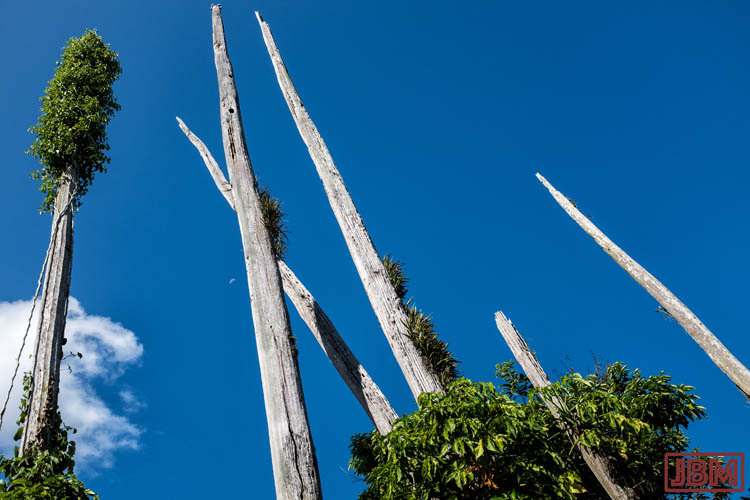 They are erected (alongside the usual carved sapundu poles) to commemorate the life and death of someone held in particularly high regard. One (the one on the right above) has a balanga (Chinese jar) mounted way up near the top. 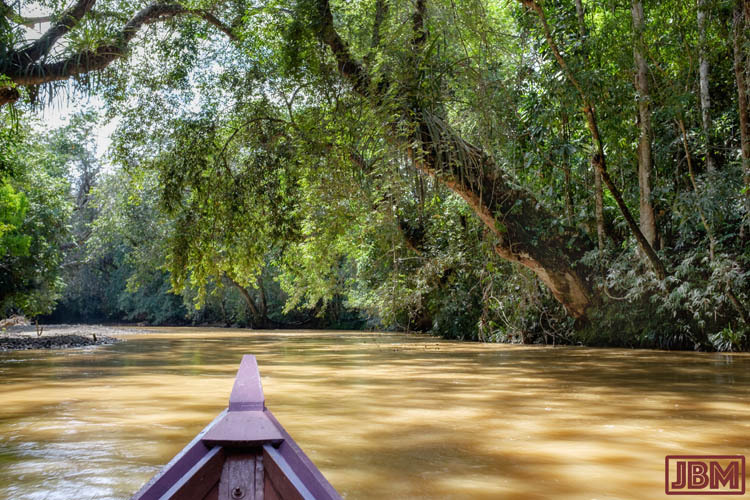 We would have liked to stay longer at Tumbang Korik, but Dodi was looking uneasily at storm clouds gathering in the sky, and worrying about the return journey back down the river and along the ‘road less travelled’ to our lodgings in Tumbang Miri. As it turned out, the weather stayed dry, and the road journey back was not complicated by fresh mud – which would certainly have made it impassable! Just next to Tumbang Miri is the village of Dandang. While walking around there the next day, we met Ibu Nila (above) sitting on her verandah making sun hats known as tanggui layah (at least, that’s what they are called by the Dayak Ngaju of the Kahayan River). These hats are still commonly worn, particularly when working in the ladang (gardens in forest clearings). 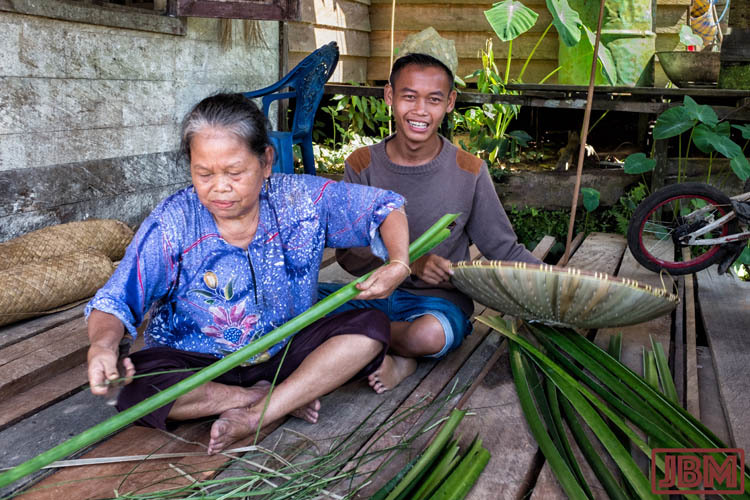 She collects the reeds of daun kajang from a nearby wetland/lake area, then trims and dries them before weaving them into the inner and outer shapes of the sunhat. Daun kajang, which comes from a variety of pandanus (I think) is also used to make panels of roofing material. A little way downstream, in Tumbang Haboan village, we visited the home of Pak Willi Inin, because he is well-known as a maker of fine mandau (traditional Dayak swords). He’s now 84 years old, but still working. He said that the blade of the mandau above was actually forged out of metal from a chainsaw. He also makes and plays the three-stringed (or sometimes two-stringed) Dayak instrument known as kecapi. The strings are nylon, but in the old times they were made of a particular kind of rattan. Pak Willi Inin played and sang some really nice traditional tunes – it’s amazing what you can do with just two or three strings if you know how. We visited another house in Tumbang Habaon because we heard that they make mandau, but ended up buying some old manik-manik (beads) from them. Pak Berlin now works at gold mining instead of making mandau. His wife Ibu Anie said that, while working over soil on the riverbank at the site of an old betang, they found a number of old beads amongst the flecks of gold and other heavy debris that gets sifted out. Manik-manik beadwork is still popular, and is prized and traded by Dayak people. Beads are often made of glass or ceramic, but most valued are those made from lilis lamiang (carnelian), which is considered to have special power of panekang hambaruan (“strengthening the soul”). The basir and pisur shaman will usually wear a string of lilis lamiang beads around their neck and/or wrists and, for some ceremonies, it is essential. 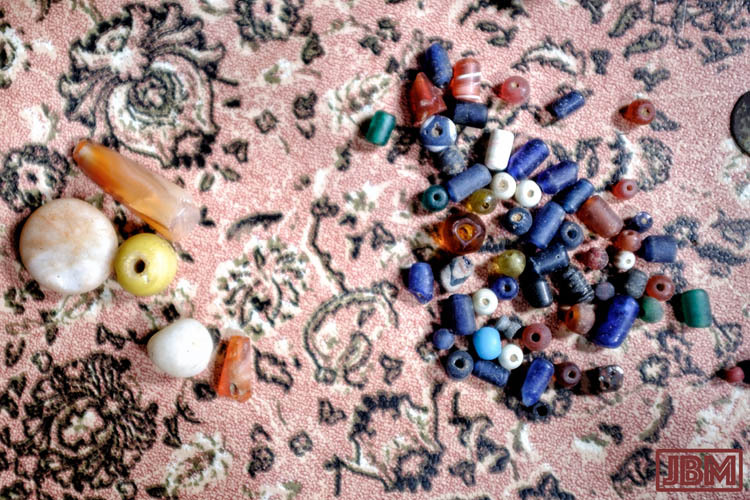 The two broken orange beads in the photo above are lilis lamiang. I read somewhere that, when the first European visitors came to Borneo in the 1500s, and travelled upriver into the interior, they were understandably amazed to find Venetian Murano glass beads (as well as beads of Chinese glass and Indian agates). Through what lengthy and complex chain of trade routes would Venetian glass have made it from western Europe to the interior of Borneo in the 16th Century? If only those beads could speak! This entry was posted in Indonesia and tagged Betang Damang Singa Kenting, Central Kalimantan, Dandang, daun kajang, Gunung Mas, Kahayan Hulu, Kalimantan Tengah, kayu pendu, kayu ulin, kecapi, kulit bajung, lilis lamiang, mandau, manik-manik, pantar panjang, sumbu tutung, Sungai Kahayan, Sungai Miri, tanggui layah, Tumbang Haboan, Tumbang Korik, Tumbang Miri, Tumbang Tajungan. Bookmark the permalink.